Enter the first supermarket you see. Check the fresh food aisle. Glance at the first meat package you see. 1 pound for 4 chunks of chicken. Great deal! How can 1 pound ensure that the producers receive a fair price, animals are reared well and respected, and the quality of produce is high? It can’t, but the chunks of chicken seem clean and appealingly wrapped in cellophane: a happy family dinner! The problem is: the sticker price is far from the real price. For ever cheaper meat we pay an enormous cost – indirectly – by damaging the environment and our health. Why is meat becoming cheaper? Farming has changed dramatically over the past 40 years. A large majority of the meat sold by the supermarkets comes from factory farms where animals are forced to grow at an unnatural pace, crammed into undersized enclosures. For example, take battery chickens: they live an unhealthy existence, without any sunlight, fresh air, and room to move. They are packed together in such a large numbers that they struggle to find space and reach their food. They are fed with unnatural diets including antibiotics. They are frequently fed to the point that their own legs break under the weight of their body. They have their beak part cut to prevent them fighting with each other while finding space. Most are completely blind with an unpigmented plumage from living in the constant darkness. Permanently under stress, they are at high risk of developing cancer cells. These chickens were never allowed to fly, touch the earth with their feet, or eat naturally and are slaughtered prematurely after few weeks of existence. Little wonder that meat is cheap. The intensive livestock business is among the most damaging sectors to the earth. According to the UN, rearing cattle produces more greenhouse gases than driving cars. Global livestock, mainly the beef and pork sector, is responsible for 18% of greenhouse gas emission and 37% of methane, more than the transport sector as a whole. The agricultural sector is the largest user of precious drinking water, using more than 70% of water resources. It is responsible for deforesting large areas, the lungs of the earth, vital for absorbing carbon dioxide. Indeed, livestock use 30% of the earth’s entire land surface! Furthermore, nearly a third of the global arable land is used for producing feed for livestock! Lands which could be used to grow crops to feed 2 billion more human instead. Only 55% of the world’s crop calories feed people directly: 36% feed livestock, 9% form bio-fuels. What’s more: a quarter of this 55% of world calories are wasted. 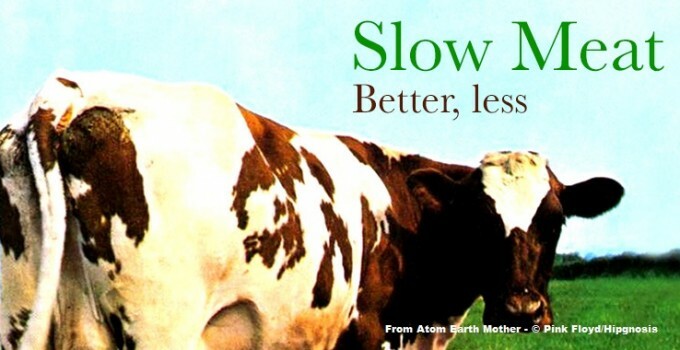 Why a Slow Meat campaign? Industrialised farming practices are largely hidden from the public eye concealing environmental, health and social issues. Slow Food believes that the way meat is produced and consumed in the current system is unsustainable, with detrimental effects on the environment, human health, animal welfare and small-scale farmers. How can we produce and consume livestock in ethically and culturally sustainable ways? Our solution: eat less and better meat; pay a fair price and support small-scale producers; always consider the origin and know where you meat comes from. A more sustainable, efficient and respectful system is a win-win situation. Now you know the real price of cheap meat – the moral, social, and environmental price of cheap meat – and if you knew and wondered why somebody didn’t do something about that, well, you’ve realised: you’re that somebody! With these issues in mind, we invite you to think about consuming ‘less and better‘ meat and and join our fight for Good, Clean and Fair for everyone.